Artist, sculptor and Master Silversmith Stuart Devlin is well known in Australia as the designer of our iconic decimal coins, the echidna on the 5 cent, the lyrebird on the 10 cent, the platypus on the 20 cent and the mob of 5 kangaroos on the dollar coin are just some of his work that you can find in your pocket. He won a competition in 1963 to design the new coins for decimal changeover in 1966 and his work and achievements from then on will amaze you. Not content with his work in the hands of millions of Australians, Devlin has designed coins for 36 other countries and countless medallions. His achievements don’t end there with trophies, furniture and clocks created in his esteemed career as well as pieces with a practical use such as surgical instruments, goblets, cutlery and candelabra. 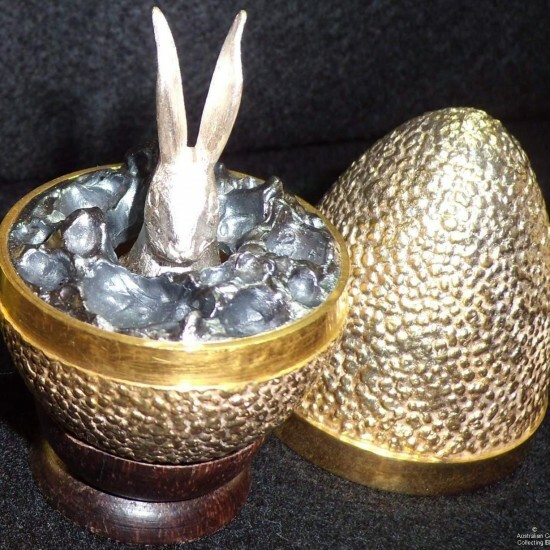 As a coin collector with broadening interests my heart leapt, when for a birthday a few years ago I was gifted a stunning silver surprise egg designed by the one and only master gold and silversmith Dr Stuart Devlin. This gift prompted a nest of eggs develop over the years with many taking on a Christmas theme, Nursery Rhyme or animals. 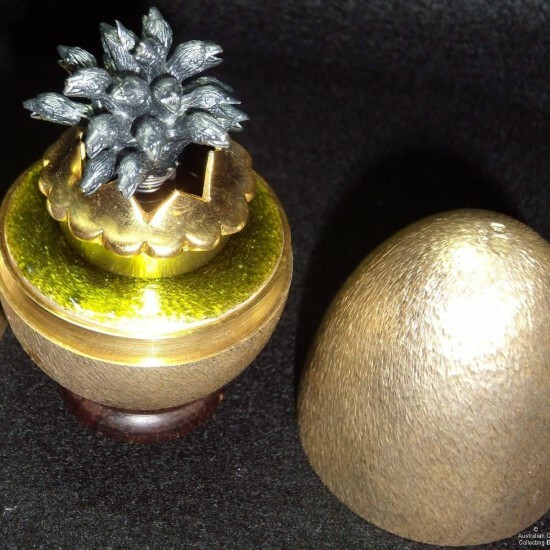 Most are limited edition, each numbered with a certificate of authenticity and some numbered on the egg itself. All are sterling silver with a gilt finish and some enameling. Each egg has a different texture of finish. All bear the special Stuart Devlin silver hallmark. 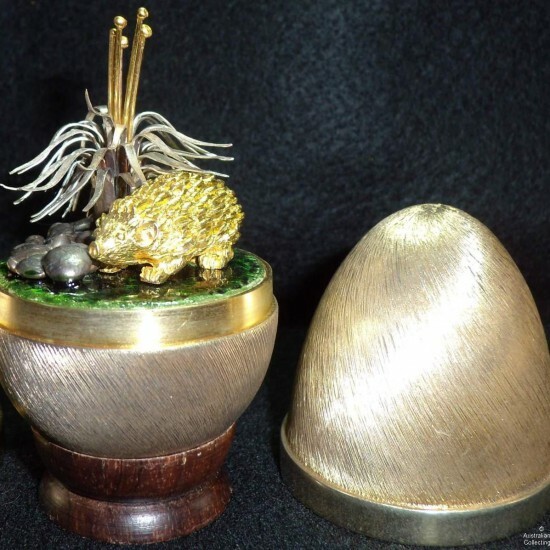 Silver Hare Egg 1969, Silver Kangaroo Egg 1974. These eggs are sprung loaded and both the Hare and the Kangaroos’ Joey both jiggle about. Issued in boxes with certificates they haven’t all survived to date. Individual eggs however can fetch from $500-$1,000. 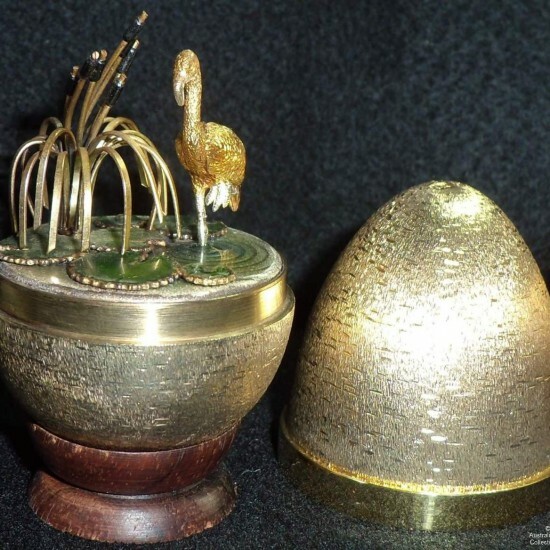 As well as eggs, amongst his creations are surprise boxes and different shaped ornaments, mementos and “dustcatchers” as Mum would call them to sit on the mantle or in the special display cabinet but today they are highly collectable and were keenly sought even at their release.